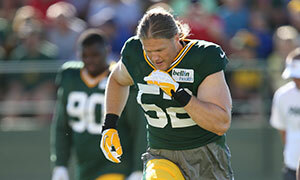 GREEN BAY — Packers LB Clay Matthews will return to practice on Monday on a trial basis, Head Coach Mike McCarthy said. McCarthy spoke with reporters briefly prior to Monday’s practice. Matthews has missed five practices, including Saturday’s Family Night, with a sore knee. “We’ll see how his workout goes today,” McCarthy said. Other medical updates will be available after practice. The Packers are switching this week to an in-season schedule following a full week of morning practices. Practices now are slated for midday as the team prepares to travel to New England for the preseason opener on Thursday night. McCarthy said the team will focus on a “fundamental” game plan rather than “scheme.” The second preseason game is also on the road, the following Sunday, Aug. 23, at Pittsburgh. McCarthy said he likes starting with two preseason road games because it gives the team a chance to learn the travel routine. He also likes having a short week following Sunday’s day off to prepare for New England, followed by a long week leading up to Pittsburgh, because those are scheduling issues the team, particularly the younger players, will have to adjust to as the season goes along. “The way the preseason is set up is good to prepare those guys,” McCarthy said.